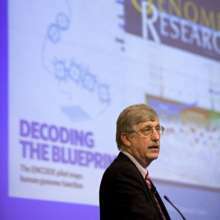 Dr. Francis Collins, MD, PhD. Director of the National Institutes of Health.Collins addressed about 500 people on Oct. 29, 2008 in the PHHP auditorium at the UF Health Science Center . The UF Office of Research maintains an extensive and searchable database of upcoming grant deadlines across all academic disciplines and sponsors — UF, federal, state, charity, private. CTSI intramural pilot grants support the growth of interdisciplinary and investigator-initiated research across UF’s broad range of scientific disciplines. The CTSI Translational Workforce Development Program provides training grants and professional development opportunities for doctoral students, medical fellows, junior faculty, faculty and research coordinators. The CTSI publishes funding opportunities in its weekly Quick Links newsletter. A list of all awards to UF, linked to their corresponding principal investigator and administrative unit, and searchable by keywords, can be found in VIVO, a new information resource for research discovery at UF. VIVO lists all 16,000 awards to the university, all 6,700 faculty, 7,600 staff and connections between them.